The simple definition that I embrace is “leaders make a difference”. Though simply stated, that definition doesn’t go quite far enough in some cases.” Positive, values-based leadership which results in a common good, combined with leaders making a difference” is a more accurate and inclusive definition. So let’s compare the leadership of former President Barack Obama and President Donald Trump. Obama inherited the Great Recession which basically had its roots in social justice lending birthed during the Clinton Administration. The United States economy is a thing of beauty. Vibrant and strong, it was able to withstand Obama’s Tax-Spend-Regulate policies. But our American economy can only be loaded up with so many job-killing taxes and regulations before it crashes. And we were close! The Obama years should have seen an early rebound and high percentage annual GDP increases after the economy cratered under President George W Bush. But that’s not what happened under President Obama with his Tax-Spend-Regulate programs. In all fairness to Obama, he never had any business background and with a half page resume what could America expect? The Trump economy in his first year, 2017, came in right where projected. A 2.3 percent annual GDP growth. 2018 looks to be right at 2.9 percent with the second quarter economy growing at about 4 percent. To put these numbers into perspective in President Obama’s eight years as President, his average economic growth was less than 1.5 percent. And Obama is the only President since World War II to never have achieved a 3 percent annual growth rate. He is one of the worst-performing economic presidents in our country’s history. Coming off the Great Recession his economy should have quickly sprung back. Job-killing regulations, and wars on coal, natural gas and business combined with oppressive measures relative to the climate and government overreach such as the Clean Water Act, which had little to do with clean water, all put a huge damper on America’s economy. That was Obama’s leadership on display for all to observe. Compare President Obama’s economic leadership with that of President Trump’s. There is a very clear difference. So far under President Trump’s Leadership the stock market has streaked to one after another all-time market highs, adding to the savings and retirements of Americans. With the stock market record highs then add the historically high employment figures for both African Americans and Hispanics and the highest level of female employment since the early 1950’s-a span of over 65 years! Our country is almost at the full employment level and the recent Tax Reform Act is putting money back in the pockets of Americans. The Democrats loudly complained that Tax Reform would leave the country with less tax revenue but the opposite has occurred! Enough on economic Leadership. Let’s take a quick look at diplomatic leadership. Obama took a road trip after his inauguration in what I recall was his “Apology Tour” where country-by-country, he apologized for our great nation resulting in a negative view of our country worldwide. Another result was the Muslim Brotherhood taking control of Egypt. President Obama kicked the “can” on North Korea allowing them to continue to perfect their weapons and provide terror groups with technology and weapons. He allowed the United Nations to become more anti-democratic and allowed NATO to continue not to pay their fair share of the cost of European security. And with American taxpayer money, he seriously meddled in the elections and sovereign affairs of Egypt, Macedonia, Libya, Honduras, Kenya, Hungary and Israel, to name a few. Obama with his State Department and USAID and sometimes with George Soros funded organizations attempted to alter other countries’ governance. His interference in the State of Israel’s affairs is particularly galling as Obama was focused on attempting to dislodge Prime Minister Benjamin Netanyahu, one of America’s closest friends. But most worrying to me is the spying operation focused against candidate and President Trump. With recent new disclosures thanks to Judicial Watch, it appears that the Obama White House initiated and guided a concerted operation by the Department of Justice, CIA, and the State Department to discredit America’s duly-elected President, Donald Trump. This operation started in 2016 and sadly continues. The Mueller investigation has been ongoing now for eighteen months. This appears to be a lawyer money grab and nothing more. What collusion? Looks like Obama was more involved in collusion worldwide and here at home than any other American President. President Trump’s leadership is totally transparent as opposed to his predecessor. Jerusalem is now the home of the United States embassy. Something in the past the Democrats advocated but not what we recently heard from the Congressional Left and the media. NATO has agreed to honor their financial commitments and North Korea is at the table finally. The Iran nuclear pact is no more. John Kerry always seems to be on wrong side of things. And President Trump has solidified relationships in the Far East and in the Persian Gulf. He continues to rework and enforce economic treaties and he is rebuilding our great military. He has shown a true love for military women and men and has taken a special focus on our permanently wounded heroes and their health care. At home he embraces our law enforcement and is in the process of closing our borders to all but vetted and qualified immigrants who will become citizens. The Left’s open borders disaster has caused a free flow of killer drugs and people into our country, some of whom are up to no good. The rule of law under Trump is to encourage legal immigration. Justice Gorsuch is displaying his focus on our Constitution, as originally written and the President’s most recent selection to the Supreme Court, Brett Kavanaugh, will further move our highest court back to adhering to the Constitution instead of the making of present day interpretations and in some cases basically creating new law. And in President Trump’s first two years, he has successfully pushed through the Senate a record number of federal judges! He is remaking our courts with conservative jurists. As an aside I want to focus on the leadership in the mainstream media, the Hollywood crowd and the ever present “talking heads”. That’s easy — there is no leadership. And the result is embarrassing tripe and crassness never before seen in America. Robert De Niro, Kathy Griffin, John Brennan, James Comey, Chris Matthews, Al Sharpton — what a crowd! The outrageous behavior of Maxine Waters and others will cause more destruction and divisiveness. 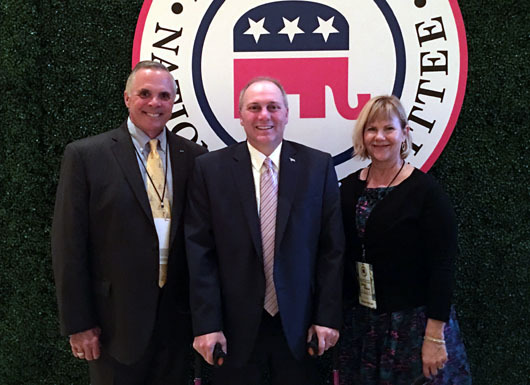 My wife Darlene and I were recently with Congressman Steve Scalise and his wife at Mar-a-Lago. A truly lovely couple and he is a tremendous leader with a big heart and love for America. The vitriol and nastiness coming out of the Left caused a nut job Bernie Sanders supporter to take an assault rifle and attempt to kill Republican congressmen and their children while all were at softball practice prior to the annual congressional softball game. This of course has totally been forgotten by the media. Congressman Scalise was using two crutches when we visited with him. Thank goodness he is recovering quickly. The Left couldn’t silence him. Leadership in America is in short supply. Especially on the Left. Despite all of the booby traps and unhinged vitriol President Trump has had to suffer through, he and his administration have recorded many positive results for all Americans. It’s ironic that Progressives don’t like progress. And one last contribution to America and our culture from Barack Obama is the onset of Identity politics — the very purposeful dividing of America. It’s textbook Marxism. That may be Obama’s primary legacy as president.